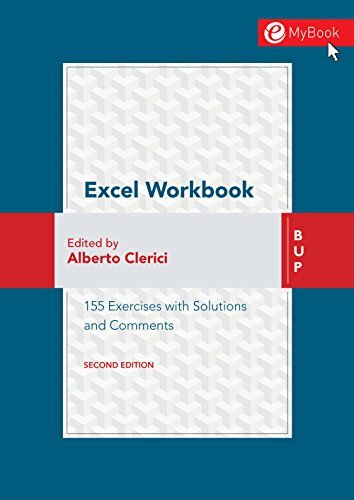 [PDF] Excel Workbook Second Edition: 155 exercises with solutions and comments | Free eBooks Download - EBOOKEE! Description: Excel is the most popular and widely used productivity software in all business environments, and it is an irreplaceable companion in ordinary work as well as in the analysis of large amounts of complex data. Nevertheless, the majority of users know and use only a very limited number of features, often in an elementary way. This workbook shows in practice the use of a wide variety of formulas, functions, and features (like pivot tables, macros, or the Solver add-in) needed to effectively and professionally work with Excel. The workbook starts with the basics and progressively gets to deal with very complex cases. It is a valuable support for college students, professionals, and managers who want to learn the basics or to improve their knowledge of Excel up to an advanced level. In the dedicated web area, all the initial and solved files are available to carry out the exercises and check the solutions. 60 exercises are commented, to highlight the basic concepts and clarify the most complex ones. No comments for "[PDF] Excel Workbook Second Edition: 155 exercises with solutions and comments".